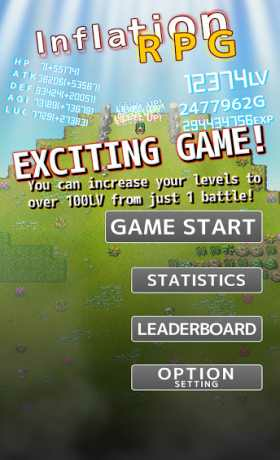 You can increase your levels to over 100LV from just 1 battle! An exciting game of steady progression. Go for the highest levels within a limited number of battles! 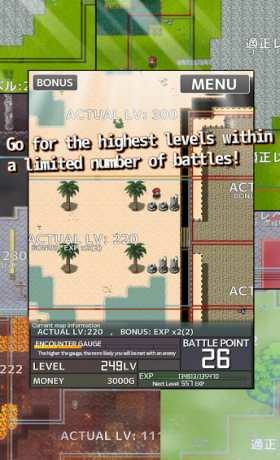 A game where the goal is to raise your levels within a limited number of battles. A vast field! On the field there are appropriate levels and bonuses helpful for getting through battles. Try to progress through the game efficiently! When your levels rise, divide your status up among characters and efficiently defeat the enemies! Ultra exhilarating high speed battle! A player can unleash multiple attacks and critical hits according to his status. 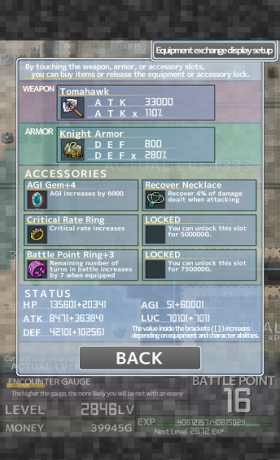 Level up efficiently with a variety of ultra powerful equipment!